This remodeled, spacious, one-bedroom Maui Eldorado Resort condominium offers comfortable non-smoking accommodation for up to 4 guests. The fully air-conditioned condominium is sparkling with a new kitchen that includes all new stainless steel appliances, new bathroom, new sofa, carpets and more. It is waiting to become your family's special 'home-away-from-home' on Maui. The bedroom has two queen-size beds with deluxe pillow-top mattresses. The living room has a new sectional, pull-out queen-size sofa-bed. TVs and DVD/VHS players are available for use in both the living room and bedroom and a library of movies is available to choose from. The fully-equipped kitchen has many new top-of-the-line appliances that will make it a joy to create a simple snack or a gourmet meal. You can enjoy dining inside, at the table that comfortably seats six or outside on the lanai dining furniture. Outside, there is a pool just a few steps from the rear lanai. There is also a gas barbecue, and wonderful views from the lanai over the pool and towards Kaanapali Golf Course. Kaanapali Beach is just a few minutes' walk away, along paths through the golf course. There is a choice of beaches to visit. Kaanapali Beach offers a landscaped walkway along the beach and resorts and past Whalers Village. Alternatively, there is the quiet end of the beach, north of Black Rock where there is a private beach cabana exclusively for Maui Eldorado guests. The snorkeling at Black Rock is among the best to be found in Maui. This is a non-smoking condominium. Check-in time is 4:00 pm. Check-out time is 11:am. Updated bathroom with large separate dressing room area. View of the pool and golf course towards the beach. Under cover parking in main garage. Sectional with pull out sleeper. Large screen TV. French door with lower freezer and ice maker. Fully updated and equipped with all you need for gourmet cooking. Television in both living romm and bedrooms. DVD and VHS for both. Direct access to lanai from the lawn area. 200 sq feet of lanai with outdoor dining and lounging. Boogie boards, snorkel sets, childrens beach toys. Dolphin pool is just a few steps from the lanai. Beautiful condo with everything you could possibly need. The condo is spacious and the pool is literally steps from the condo lanai. This was our second time staying at the Maui Eldorado, it is a beautiful condo complex. The beach and pools are fantastic. The trolley service is also a great feature. A fantastic spot and a beautiful condo! My fella and I had a fantastic week at this condo. It was a great location at a really lovely property. The condo itself was super comfy and had an absolutely AMAZING kitchen that we enjoyed very much. The owners have thought of pretty much anything guests could need from beach toys to coolers--even a hairdryer and curling iron! We were worried that we'd miss having a view since the condo is a first floor unit, but being so close to one of the three (THREE!) newly refurbished pools more than made up for not having a view. We could sit on the lanai and feel like we had our own private pool. And don't worry about noise--this resort is small enough that things are quiet and folks are respectful! When you're ready to head to the beach, it's a short walk from the condo to the Maui Eldorado's comfy and convenient beach cabana. Don't feel like walking? Call the front desk, and someone will come to your condo in a golf cart and whisk you to the beach! (They'll bring you back later, too!) There's a communal kitchen down at the cabana which is perfect for keeping lunch cool while you enjoy the sun. We never rent a car when we're in Maui, and public transit is a snap from this location. We took the free trolley to restaurants and shops nearby, and the bus stop is very convenient for trips to Lahaina Town. Absolutely love this condo, perfect location, private cabana on the beach and the owners are great! You can walk to Whaler's when looking for shopping or food, but are far enough away from Whalers to keep the beach nice and quiet, feels like your own private beach! The condo is clean and updated and stocked with everything you need for the beach and tons of kitchen essentials for cooking. We'll be back again soon! Our family of 4 (me, wife, and 6 & 4 year old daughters) just had an amazing Maui vacation and the condo was absolutely perfect for our needs. Could not have asked for anything more with the condo and the Maui Eldorado property itself. The condo: Kitchen was stocked with any and all types of cooking utensils, pot, pans, indoor & outdoor plates, etc. We typically ate 2 out of 3 meals in the condo and always had what we needed to make those meals. Living room and bedroom were perfectly fine, no complaints. With two queens in the bedroom and a very comfortable sofa bed, the condo could sleep up to 6 if absolutely needed. The patio with views of pool and golf course was where we ate every one of our meals at the condo. The Eldorado property: Pools were clean and we were always able to find lounge chairs and umbrella when we visited. The main pool has recent upgrades and worked great for us. There is a baby pool (1' deep) attached to the main pool which is great for little ones that aren't quite ready for the main pool. Our girls loved that they could touch at the entrance of the big pool and spent most of their time swimming back and forth at the shallow end. The main pool also had a large "grass" (turf) area for sunbathing away from the pool, frisbee, throwing a football etc, along with shuffle board and bocce ball near by. BBQ grills were in great shape and staff came by daily to clean them. Access to the beach cabana via the golf court was awesome, especially for the kids. They loved it. The cabana was a nice feature for beach days with access to a fridge, stove, ice machine, microwave, lounge chairs, sun or shade depending on your preference. Saw a few large parties (wedding groups or family reunions) and wife and I talked about Maui Eldorado being setup very well to accommodate larger groups. Any of the guests we interacted with were very friendly and we met people from all over the U.S. Canada, France, Australia, and Germany. 10 minute walk to Whaler's Village (15 minutes when walking with kids). We would stay at this property again if we are fortunate enough to be able to go back to Maui. Owner Geoff was very quick to respond the one time we had a question. It is really just enough to be in the beautiful state of Hawaii; however this incredible condo and The Maui Eldorado really enhance the stay!! The condo is perfectly appointed and being located right near the pool is a total bonus. 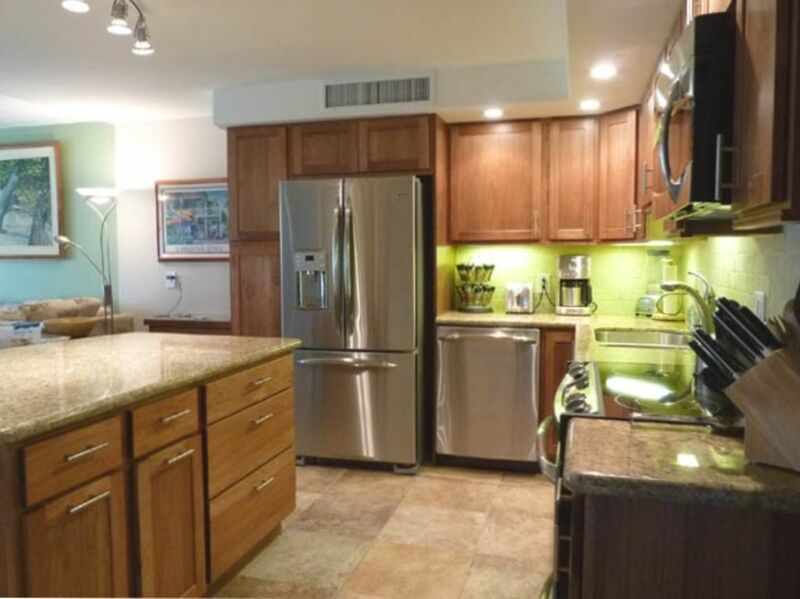 This condo is impeccably clean with comfortable bedding and furniture with dining area inside and also out on the patio help make this condo a fantastic, relaxing place to settle in for your Hawaii vacation!! The walk to the ocean is, well a walk in Hawaii, so it's not bad; however hopping the golf-cart shuttle to/from the beach cabana is a great option. Another bonus is the parking garage to get your vehicle out of the heat of the day. The newly remodeled pool area above the garage has a great lounge/grilling area which included a turf setting for more lounging -- would make a great location for a large gathering. Condo was very clean. Great location - next to Royal Kaanapali fairways. Enjoyed pool steps away. Really enjoyed our recent return visit to unit C103. Condo was very clean and well equipped with everything we needed. My wife and I enjoy eating in and made use of the barbecue nearby. Also enjoyed the pool just a few steps away. We look forward to returning to this unit in the near future.